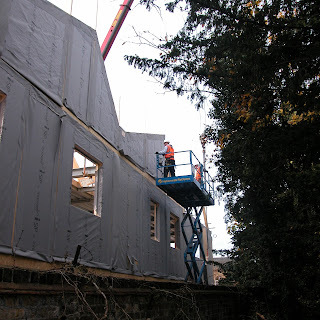 This is the second of an on-going series of blogs that aim to create a photographic log of the construction process at the Phoenix HQ. 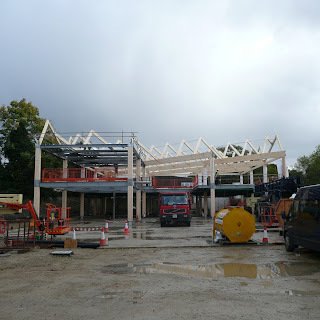 At the end of October (click here to view previous blog) a couple of bays had been erected and we could look forward to the completion of the first half of the frame by the end of the month. When we next returned to site at the beginning of the month the first half of the composite frame had been erected and the construction team were starting preparation for the first floor’s metal deck to be laid. One week later the metal deck was down, and for the first time we were able to gain access to the first floor. 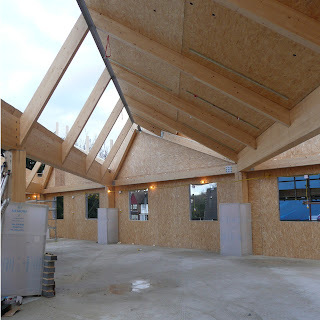 At this point the scale of the spaces had started to become more apparent and we were able to envisage how it will feel when the building is in use. After a two week absence from site the concrete for first floor slab had been laid and work is currently progressing with attaching the SIPs to the composite frame, although there have been some delays due to high winds. 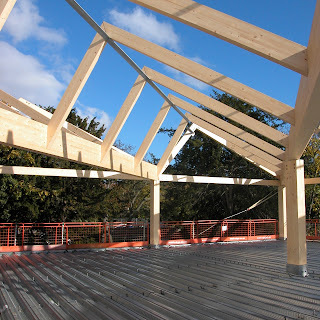 Phase II of the frame started on the 26th of November and will be complete within the next 3 weeks, when the overall mass of the building should become clearly visible. Concurrent with this, the blockwork is due to commence on the ground floor any day now and the layout of the public spaces and lift shafts will start to take shape. This should all be complete by the 6th of January when first fix is due to commence.